There are nine meetings per year, typically held on the third Thursday of each month at 4 pm. ​No meetings are held in July and August, unless requested. A year-end celebration luncheon for members is held in December. The October 2017 meeting was held at Duane Morris, and featured a stellar panel of highly regarded experts on the subject of NORTH KOREA, WAR OR PEACE. 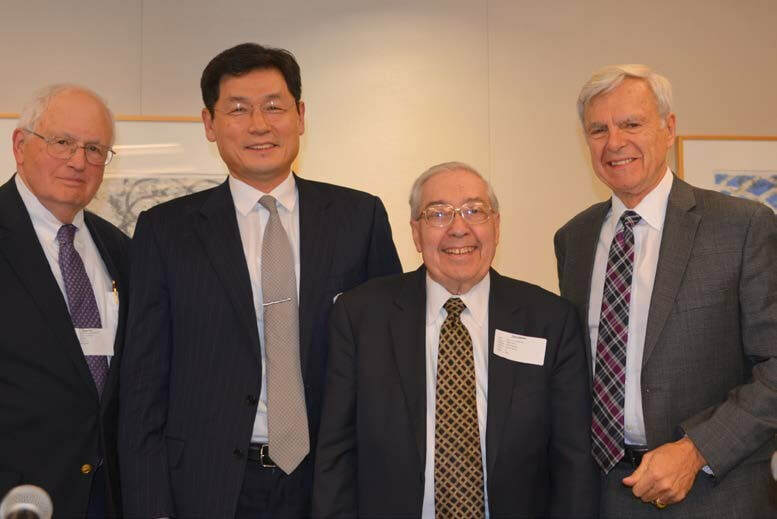 The panel was moderated by Harry Edelson, with panelists Ambassador J. Stapleton Roy, Consul General Gheewhan Kim of the Republic of Korea in New York, and Admiral Bill Owens. 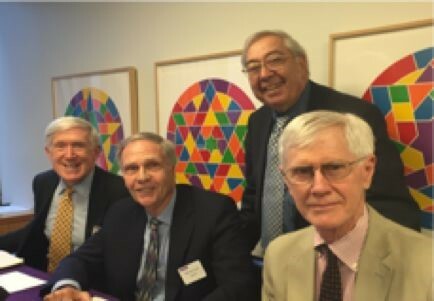 Ambassador J. Stapleton (Stape) Roy, is Director Emeritus of the Kissinger Institute on China and the United States at the Woodrow Wilson International Center for Scholars in Washington, DC and a Distinguished Scholar at the Center. He joined the US Foreign Service immediately after graduating from Princeton in 1956, retiring 45 years later with the rank of Career Ambassador, the highest in the service. His final post with the State Department was as Assistant Secretary for Intelligence and Research. Consul General Gheewhan Kim, began his post as the Consul General of the Republic of Korea in New York on April 7, 2015. Prior to his appointment, he served as the Minister for Economic Affairs at the Korean Embassy in Washington, DC. Mr. Kim served as the Coordinator at the ASEM Vision Group Secretariat, which helped 26 Wise Men of Asia and Europe prepare a vision report on Asia-Europe relations in 1999. He completed military service as Lieutenant at the Judge Advocate General’s Office and at the Fleet Command of the Korean Navy. The June 2015 meeting of the China Investment Group, held at DENTONS, the worlds largest law firm, featured three prominent China experts discussing topics of major importance to the future of China - United States relations. Harry Edelson, Chairman of the China Investment Group, moderated the meeting. Robert Hormats, Vice Chairman of Kissinger Associates; former Under Secretary of State for Economic Growth, Energy, and Environment; former Vice Chairman of Goldman Sachs, International. Ambassador Winston Lord, is Chair Emeritus of the International Rescue Committee, former US Ambassador to China; former Assistant Secretary of State of East Asian and Pacific Affairs; past President of the Council on Foreign Relations, member of US delegation to China with Presidents Nixon and Ford and frequent visitor to China with Dr. Henry Kissinger and others. Stephen S. Roach, Senior Fellow Yale University, former Chairman of Morgan Stanley Asia. He also served on the research staff of the Federal Reserve Board in Washington, D.C. from 1972-79 — where he supervised the preparation of the official Federal Reserve projections of the U.S. economy. Prior to that, he was a research fellow at the Brookings Institution in Washington, D.C.Mr. Roach is widely recognized as one of Wall Street’s most influential economists. His research covers a broad range of topics, with recent emphasis on globalization, the emergence of China, productivity and the macro paybacks of information technology. Xiaojing Li, General Manager of Bank of China, U.S.A. and President of China General Chamber of Commerce, U.S.A. Chinese companies are increasing their activities in the United States at a rapid pace. Mr. Li is an expert in this area through his leadership of the Bank of China, one of the largest and most global of China's banks. Mr. Li has been with Bank of China since 1987 in verious posts around the world including Beijing, Sydney, Luxembourg and since 2004, New York City. Ambassador Paul W. Speltz, Chairman and CEO of Global Strategic Associates LLC, served as U.S. Executive Director and Ambassador to the 63 nation Asian Development Bank (ADB) during which time he also acted as the U.S. Treasury’s Financial and Economic Emissary to China. He has also served as President of Kissinger Associates Inc. and has held executive positions with Bluestone Capital and United Technologies in Singapore and helped found ATC International, an Asia-based marketing and consulting company, with an emphasis on China, Japan, and other Asian countries. Stephen A. Orlins, President of the National Committee on United States – China Relations (“NCUSCR”). Over the past 40 years NCUSCR has been a pioneer in building a strong and positive relationship between China and the United States. It’s Board is a “Who’s Who” of key figures in this process and includes: Carla Hills, Hank Greenberg, James Sasser, Madeleine Albright, Lou Gerstner, Henry Kissinger and many other prominent figures. Stephen Orlins has an illustrious background in China and international relations. Edward F. Cox, Esq. Chairman of the Corporate Department of Patterson Belknap Webb & Tyle. Ed made his first trip to China in 1979 with President Nixon (his father-in-law). He has served three Presidents: Nixon, Reagan, and George H.W. Bush. He is a graduate of Princeton and Harvard Law School. David N. Laux, Trustee and Former Chairman of Taiwan Greater China Fund. He served as Dirctor of Asian Affairs on the National Security Council, was Chairman and Managing Director of American Institute in Taiwan and was President of the U.S.-Taiwan Business Council. Henry H. Liu is a partner in DLA Piper's Corporate and Finance practice. He was honored with the "Asia Star Award" by BusinessWeek as China's national policy-maker, consecutively in 1998 and 1999, together with top Chinese and Asian national leaders, for his role in addressing the Asia financial crisis and in building China's capital and financial markets. He received the "Global Leader for Tomorrow Award" from the World Economic Forum at the Global Summit in Davos in 1999. AsiaWeek (Times Inc.) recognized him as a "Nation Builder" at the 50th anniversary of the People's Republic of China in 1999. Xiaobo Lu, PhD is a professor of Political Science, Barnard College at Columbia University, Weatherhead East Asian Institute. Xiaobo Lu was the founding Director of Columbia Global Centers | East Asia in Beijing in 2008-10. While in China, he was a visiting professor at Tsinghua University and taught courses at the School of Public Policy and Management at Tsinghua. Xiaobo Lu is a member of Council on Foreign Relations, Committee of 100, and the National Committee of US-China Relations. He is a regular commentator on China and US-China relations on PBS, CNN, BBC, and Professor Lü received his PhD in political science from the University of California, Berkeley, in 1994. Steve Barclay is the Director of Hong Kong Economic & Trade Office. He is responsible for promoting and strengthening the business, trade and cultural ties between Hong Kong and 31 of the United States eastern states. He was Director of Hong Kong Economic and Trade Office in Sydney for four years and prior to that was a public sector reform advocate and internal management consultant in the Government’s Efficiency Unit. He has served a wide variety of posts including consumer protection, intellectual property, housing, and environmental protection. Li Bin, Counselor for Economic Affairs, Embassy of the People’s Republic of China in the U.S.A.
Rebecca H. Patterson, Managing Director and Chief Investment Officer of Bessemer Trust. Prior to joining Bessemer, Ms. Patterson was chief markets strategist at J.P. Morgan Asset Management. In that role, she headed the global client advisory group and was a member of the private bank’s investment committee.